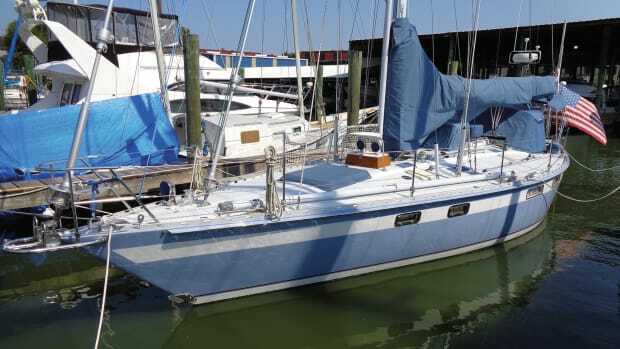 We began our sailing adventures while living and working in Dallas, Texas, cruising the Bahamas three to four weeks a year back in 1985 on Oh Kay, otherwise known as the (Not) Oh Kay, a 36ft Island Trader ketch. 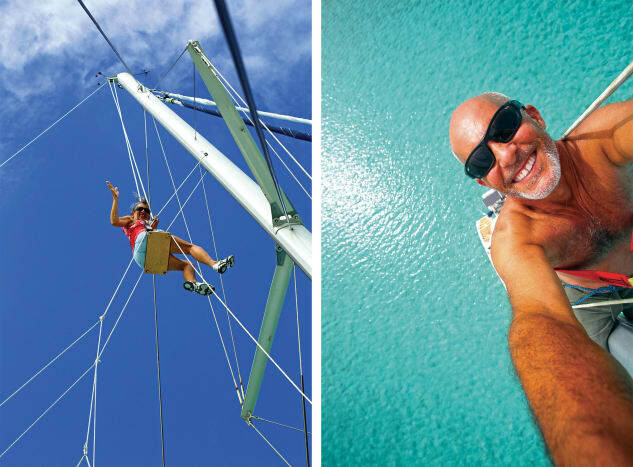 We wrote a humorous eBook about our adventures, (Island Sailing Is NOT all Rum and Bananas). We sold the worn-out boat in 2006. In 2009, we were both approaching the midlife crisis stage while working 70 hours a week in our Mom and Pop oil business. I came home one night to find that Jan had quit. Without Mom, there is just Pop and that does not make for a fun business environment. Jan wanted to buy another boat and go cruising again. There are not many husbands who are lucky enough to have a wife who demands that they buy a boat and go cruising. 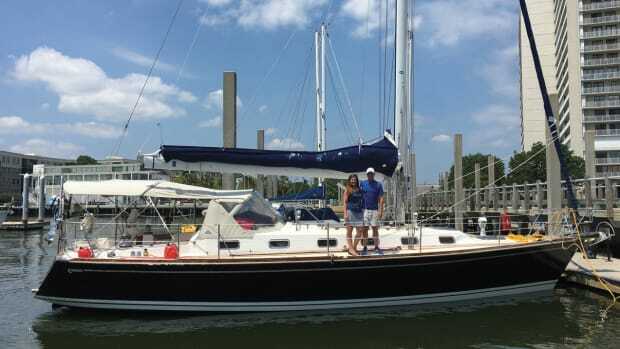 I was smart enough to listen to her (for once) and bought her a Beneteau 473 which she named Wild Thing. We cruised from Texas to the Bahamas to the Chesapeake twice. In 2012, we left the protected waters of the Bahamas for the rough and wild Eastern Caribbean, cruising Wild Thing from the BVIs to St Maarten to St Lucia. Here’s how we crossed over to the dark side and bought a cat: Compared to the Bahamas, the Caribbean is rough. Anchorages are not always fully protected and it is common for a swell to appear without warning. Murphy’s Law dictates that the anchored sailboat will always lay parallel to the roll, on our monohull, this resulted in a roll so pronounced that bananas flew off the shelf across the cabin. We called it the “banana roll” and it was beyond annoying. Reading was impossible. Sleep was sporadic. Tempers were short. Unhappy wife meant unhappy life. One evening while I was rowing around in the dinghy trying to set a stern anchor to back Wild Thing into the swell and save our marriage, Jan noticed that the nearby cats were not rolling like we were. In fact, the cat people were having boat drinks in their spacious cockpits while being entertained by my dinghy rowing stern anchor setting antics. That night, I told Jan that she could start looking for a cat. We knew we wanted a 44ft cat with the galley up and an owner’s layout. However, we figured out that Jan’s Imelda Marcos sized shoe and wicker basket collections would quickly overwhelm a 44ft cat. 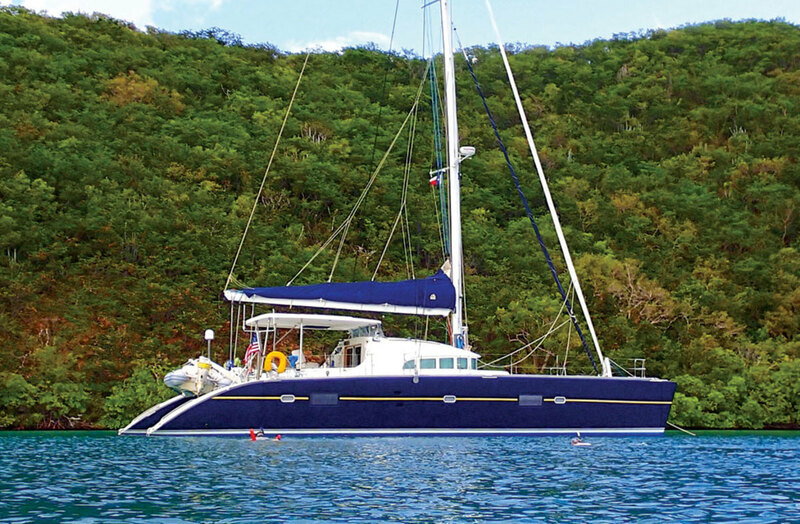 After months of looking, we ended up buying a custom-built Lagoon 570 in St Maarten. It is ridiculously big for just two people, but it has enough room to throw some great parties. Our record number of people onboard for sundowners currently stands at 18. Jan and I have sailed Wildcat on four round-trips from the USVIs to Grenada or Trinidad, stopping at every island and rum distillery in between and making dozens of cruising friends along the way. If we have one important message for people who want to go cruising, our recommendation is do it! Don’t wait. Do it now. If not now, soon. The younger, the better. We are cruisers who both work in the sailing industry, I’m a semi-retired photojournalist and Debbie is a writer. Originally from New Hampshire, I moved west right after college and never looked back. Debbie was born in Portland, Oregon. Her first sailing experience was in a tiny dinghy on a big lake; every time they tacked she was certain they were going to capsize and drown. 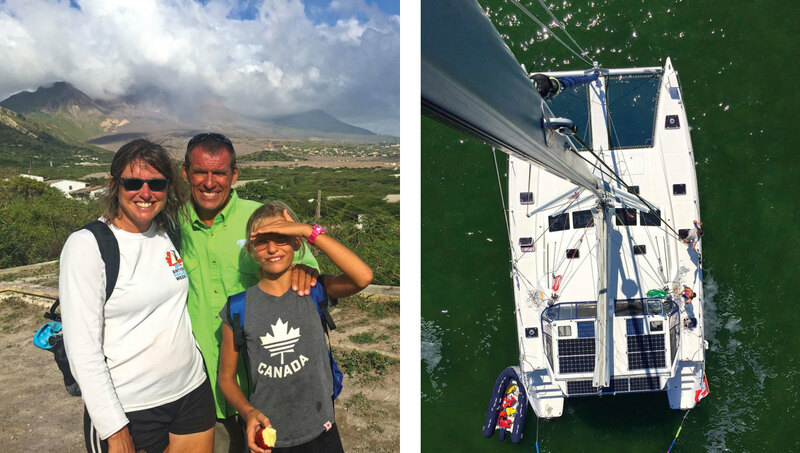 That made the decision to quit sailing pretty easy, although it waylaid her life-long dream to live on a boat and cruise the Caribbean. That vision of the bohemian nautical lifestyle finally came true in 2013 when we purchased INDIGO and took off south. When thrown into the deep end you learn to swim fast, and despite the steep learning curve she was soon at home on the ocean. I bought my first boat, a 42ft Fountaine Pajot Venezia, in 2003 and sailed her from San Diego, California to Mexico where I cruised the Sea of Cortez before moving south. I sold her in Puerto Vallarta in 2008. Overall, I’ve cruised over 22,000 miles in Mexico, the Pacific Northwest, New England and the Caribbean from Florida to Grenada. 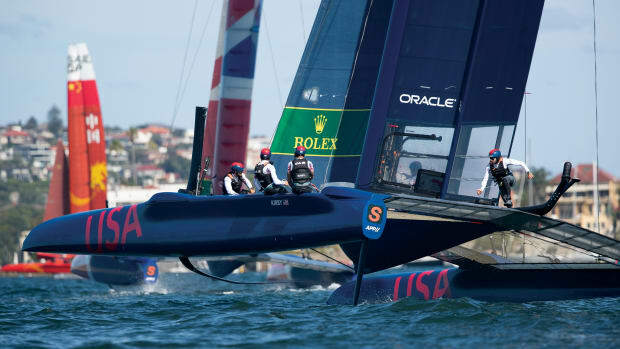 I also crewed on the winning boat in the 2006 Newport to Bermuda race. Debbie makes her way up the mast, putting the bosun’s chair to good use; Eric enjoys a different point of view. We searched for three years to find the “perfect” cat, looking at virtually every brand, size and style until we found INDIGO, a 2008 Leopard 46 (owner’s version). It has just about everything we could have asked for, from 1,300 watts of solar, lithium batteries and good motor access to a roomy interior, a watermaker, washer/dryer and lots more. We were pleased. We’ve been cruising six months a year for the past four years, from Florida to Grenada and back. While we’ve loved it, we’ve recently come to a point where we are ready for a change of pace and we are selling our beloved INDIGO. It’s bittersweet—we love the boat but want to spend a summer cruising to Alaska and we don’t feel that INDIGO is the best boat for those conditions—not to mention she’s in Florida. Our next boat may be in the South Pacific somewhere. Our advice for those contemplating this lifestyle: be prepared and do your homework. That said, don’t over-analyze everything to death. When buying a boat make a prioritized list of what you think you want and what you need, (different lists). Then start shopping and ask a lot of questions. It took us three years (looking at hundreds of boats, going to boat shows, talking to brokers and searching on-line) to find the right one. 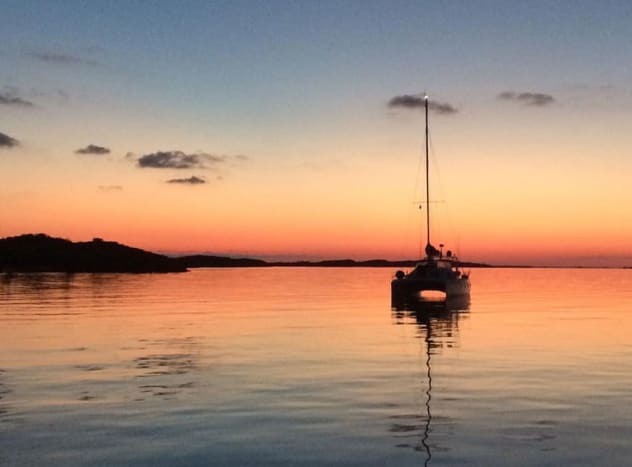 Your first boat might not be “perfect” but it will help you learn what is important to you. Finally, be prepared to fix things. Many things. Everything. The true definition of cruising is, “Fixing things in exotic locations.” Never has there been a truer adage. If you’re not ready to repair absolutely everything on your boat, you may want to consider a different activity. In the long run though, nothing is more satisfying. We are Bill and JoAnne Harris from Clear Lake, Texas (the location of the NASA Johnson Space Center). After owning and running a day charter business for over 20 years as well as working corporate jobs, we untied our docklines for the last time and set sail on the amazing cruising adventure we had always dreamed of. During our first three months, we added a third crew member by adopting a beautiful Siamese kitten in Georgia that we named Sailor. We have cruised full time aboard ULTRA for almost 10 years now! After exploring the US Gulf Coast and East Coast, we spent several months exploring the remote islands of the Bahamas. Following that, we cruised all over the Caribbean by island hopping our way down the island chain as far as beautiful Grenada. We spent a couple of epic seasons cruising up and down the spectacular windward and leeward islands. We then made the decision to begin our journey west and had a blast checking out the unbelievable cultures, making lasting memories in every country on our passage back up the island chain to Puerto Rico, across the Dominican Republic and Haiti, Cayman Islands, Honduras, Guatemala, Panama and Colombia. We have spent the last couple of years exploring Panama, making treasured memories with our Kuna Yala Indian friends. We have had the fabulous opportunity to experience two Panama Canal transits: once aboard a luxurious French catamaran and the other a classic American monohull. We have also cruised aboard other sailboats in the Med and French Polynesia. ULTRA is a USCG approved 49 passenger rated custom trimaran of Norman Cross design and built by Bill. It is the largest passenger carrying sailboat in Texas. It took Bill four-and-a-half years to build her, launching her in 1988. She was built for day chartering as well as with the dream in mind to eventually cruise aboard her full time. When we left, we never really thought about how long we would cruise for. Having always shared the common interests of our love to sail and to be on the water, and already spending every day together working in our landlubber lives, cruising aboard and being together all the time was an easy transition for us. Some couples might find this challenging, but we feel truly blessed. Fast forward almost 10 years and thousands of nautical miles, and we are still having a blast. 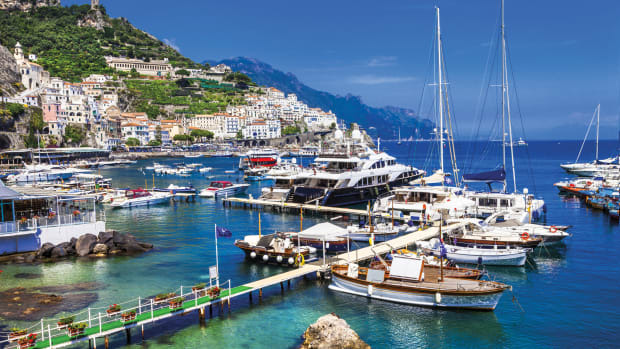 Our advice to everyone that dreams of cruising life is that it is all about attitude. If you approach life with a great attitude and sense of humor, then you are sure to enjoy this amazing lifestyle to the fullest. There will be many challenges, and some will demand tremendous physical and mental strength. While you will discover a lot about yourself, have many life-changing experiences and accomplishments, just keep in mind everything on board will be in one stage or another of being broken, and that it’s not all about pina coladas and drink umbrellas. However, it’s worth it. Just remember to go with the flow! 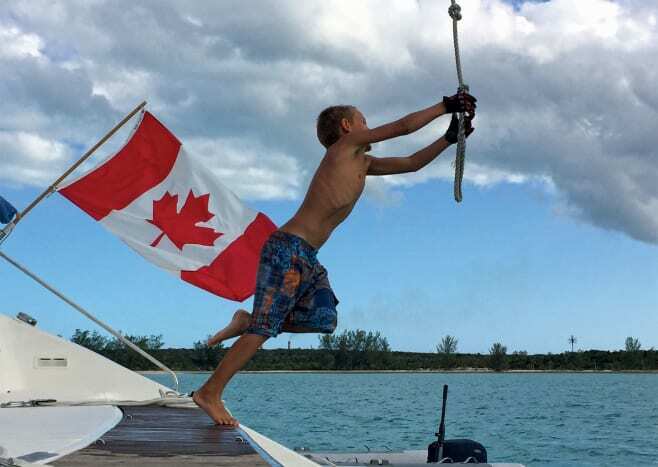 We are a Canadian family with four young kids; Betty (11), Paul (9) and six-year-old twins Karen and Henry. We’ve been cruising for almost two years, homeschooling our children as we travel. Married for 14 years, we met in Ottawa and lived there for many years. 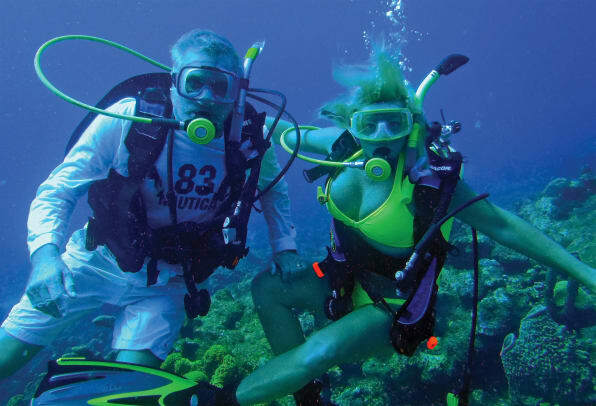 We share a passion for adventure and enjoy a challenge. Our kids have a variety of interests, from swimming and fishing to drawing, singing, reading and disassembling a variety of electronic devices. So far, we have sailed 2,500 nautical miles from Palmetto, Florida through the Bahamas and the Caribbean to the Tobago Cays, Saint Vincent. We are on our way to Grenada where we will be spending the first few months of hurricane season before going to Tobago and then on to Trinidad. Aphrodite, was built in South Africa in 2005 and is hull #1 of the St Francis 50 line. She has four berths, four heads and good-sized water and diesel tanks. We like the shaft drives, high bridge deck, the large, dedicated navigation station and her speed under sail…we could go on and on. She is our home and she treats us well. From the onset, we liked the ruggedness, space and safety that Aphrodite provides. She had a reputation for good sailing performance. Under sail, Aphrodite can cover 200 nautical miles a day. The buying process took us about six months. We were new to boat ownership. Safety was foremost in our minds and we wanted room for our family to grow. We also wanted a boat that could us accommodate us and four young children now, and later when they are teenagers.  A fortuitous and unexpected discussion with Jimmy Cornell at the Annapolis Boat Show reinforced our decision to adopt this lifestyle and our thoughts of circumnavigating. Back home we continued our research and became familiar with the different types and styles of catamarans. We reached out to other catamaran owners. One couple from California sent us a pre-purchase document they created called “Technical Yacht Criteria.” This spreadsheet was extremely detailed and helped steer us to the purchase of Aphrodite. My husband also sought advice and guidance from industry experts, which led to meeting Pat Reischmann. Pat was instrumental in developing the Manta catamaran line. Through Pat we met Dave Houston, a former St Francis 50 owner. Then, following the Miami Boat Show in February 2015, Rick, Pat and Dave inspected a St Francis 50 in Fort Lauderdale. The boat exceeded our expectations and an offer and purchase quickly followed. After a six-month refit, managed by Pat, which I documented on my blog, we were ready to sail. In September 2015, we left Regatta Pointe Marine in Palmetto Florida and there has been no looking back. Our plans are to spend the summer in Grenada. We are then going to Tobago and next to Trinidad to haul-out. After that, we are planning to go through the Panama Canal and head across the Pacific. We’d also like to circumnavigate. Education is very important to us. So, our plans will depend, to an extent, on the success of homeschooling. We enjoy cruising with our family very much. We have met interesting people and been exposed to cultural nuances that you won’t read about in any textbook. But, the lifestyle is not for everyone. It requires perseverance and sacrifices. Our best piece of advice would be to speak to people. We didn’t know a lot about boat ownership and maintenance. But, even if you are a seasoned old salt—we suggest that you seek out experts. Since the early days, we have forged relationships with people who are the best in their field and it has made all the difference in our understanding and decision making. Finally, a practical recommendation would be to try wrap up your affairs at home as much as possible before you leave. Arrange your mail, and plan for taxes. We rented our house and hired a property manager. 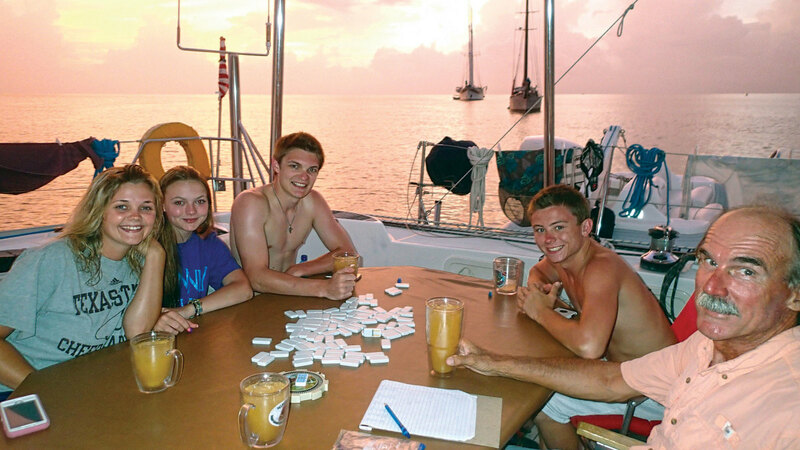 We cannot stress enough that once you sail away, communication and Internet use becomes expensive and more difficult. However, the need for WIFI often gives cruisers a reason to step ashore and find themselves a cold beverage. 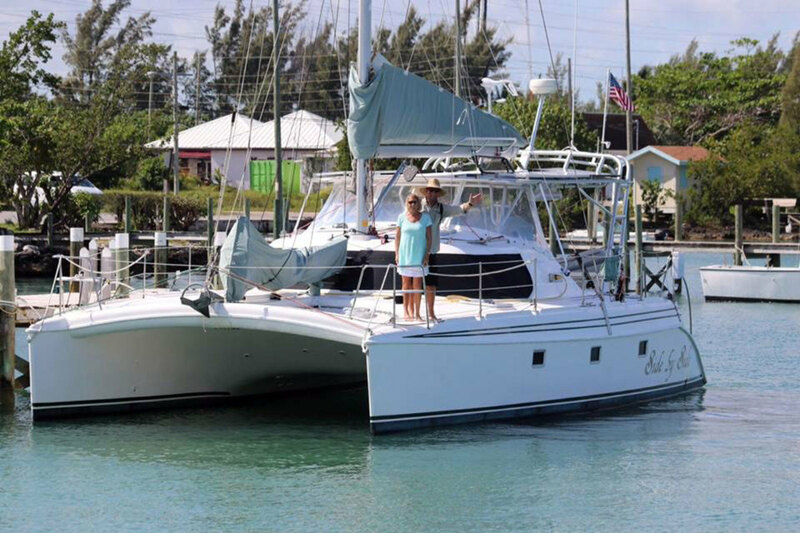 We are Rich and Linda Kallerud, and we are currently cruising our boat Side by Side a Manta 42 catamaran, built in 2000. We’ve lived on different boats over the past 20 years, sailing to sixteen countries. I got my tonnage Master’s license in 1997 and my wife, a very competent sailor, has her HAM radio license. After selling our home in Minnesota we came to Fort Lauderdale, Florida specifically to look for a catamaran to live on. Our boat had just completed a six-year cruise by a family that took great care of her. 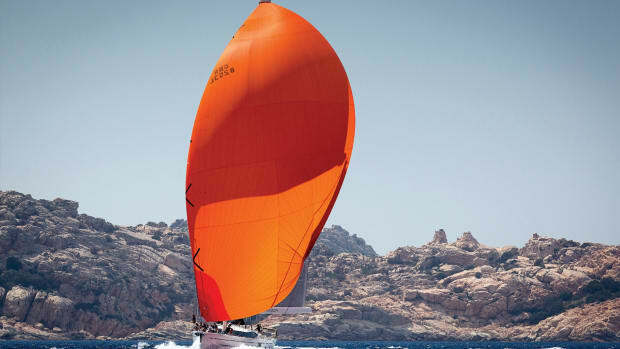 Manta catamarans are all owner’s versions, with full factory-installed systems. These included a watermaker, solar panels, diesel generator, full electronics, air conditioners and a bimini/dodger aluminum super structure with incorporated davits. 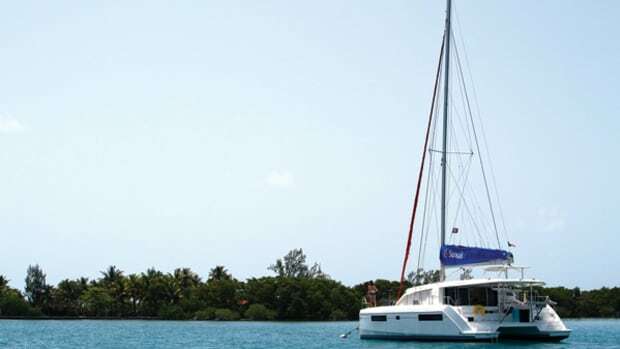 Manta catamarans are built for offshore sailing and world cruising. For the last five years, we have divided our time between Florida and the Bahamas. We spend most of the year in the Bahamas and hope to cruise the western Caribbean in the future. 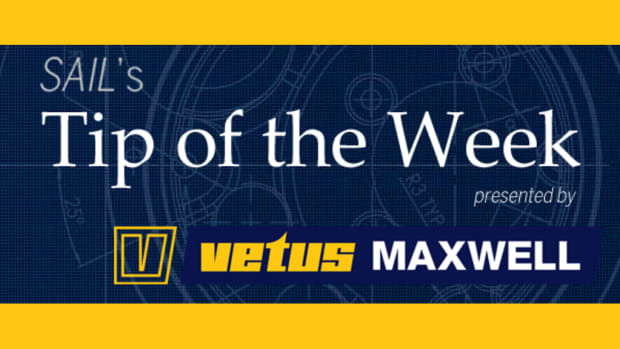 Advice: It’s all about the weather! We were both competent sailors on the Great Lakes before we started cruising, sharing the dream to sail off someday. What has really helped us to continue to enjoy our cruising lifestyle is our attention to weather. We think that this is where many new cruisers mess up, resulting in passages which challenge both skills and comfort. We have always used a weather service, currently Chris Parker on the SSB radio and his email forecasts. We wait for good weather and we don’t let other boaters influence our weather decisions. We almost never “buddy boat,” because that often has folks traveling based on someone else’s idea of a good weather forecast.